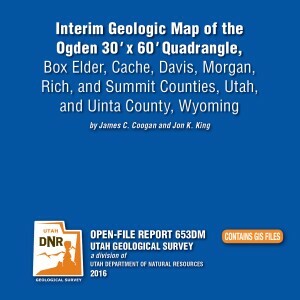 The Ogden 30’x60′ quadrangle covers the populous Wasatch Front near Ogden, Utah, and the adjacent Wasatch Range, and extends eastward into Wyoming near Evanston, Wyoming. It covers parts of the Ogden, Weber, and upper and lower Bear River drainages. 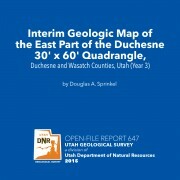 The Ogden quadrangle is economically important because of the gas and oil fields on the east margin of the map area, the cement plant near Devils Slide, numerous sand and gravel operations, water resources, and recreational interests. 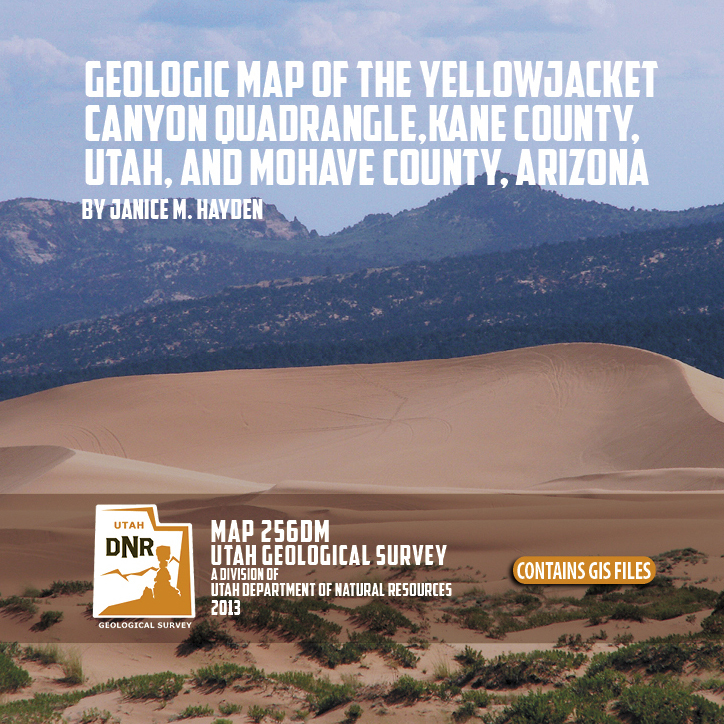 The Yellowjacket Canyon 7.5′ quadrangle is divided north-south by the Sevier fault zone with the lower Navajo Sandstone and older rocks creating the Vermilion Cliffs step of the Grand Staircase on the up-thrown block to the east, and the upper Navajo Sandstone and younger rocks creating the White Cliffs step of the Grand Staircase on the down-dropped block to the west. Exposed strata range from the Triassic Petrified Forest Member of the Chinle Formation to the Jurassic Co-op Creek Limestone Member of the Carmel Formation. Eoloian sand dunes, including those of Coral Pink Sand Dunes State Park, stretch northeast to southwest across the map area. 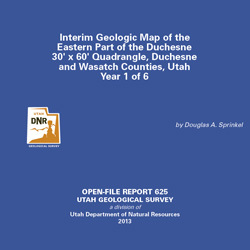 This CD contains geographic information system (GIS) files in ESRI file geodatabase and shapefile formats. Also included are two plates-the geologic map at 1:24,000 and the explanation sheet-both in PDF format. The latest version of Adobe Reader is required to view the PDF files. Specialized GIS software is required to use the GIS files. 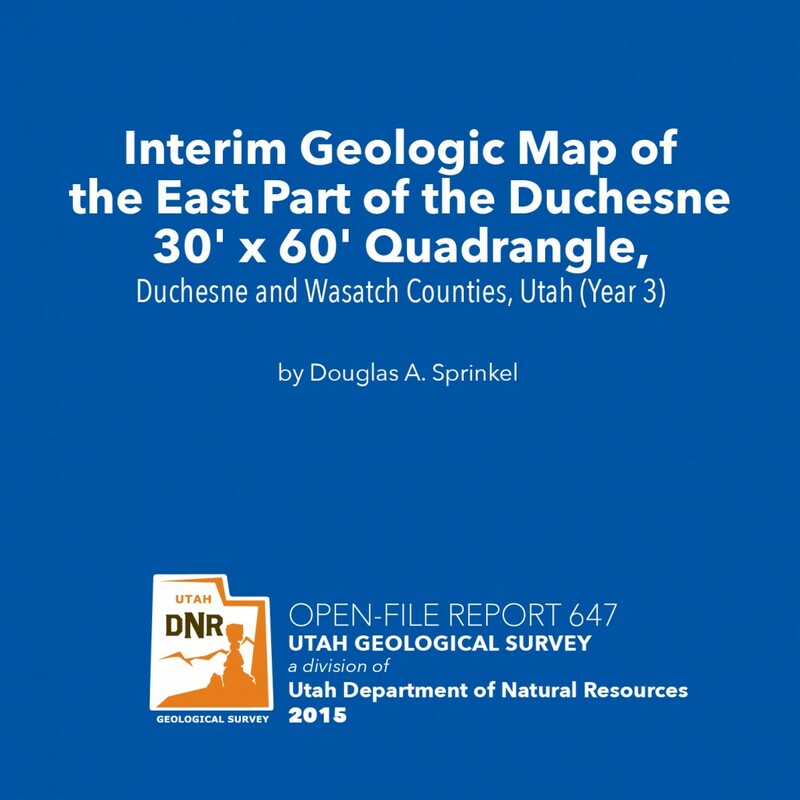 The Utah Geological Survey has released a full-color geological map of unprecedented detail of 1,800 square miles of the central Wasatch, which includes wilderness areas and public lands along with human-infested areas, including Heber and Payson. 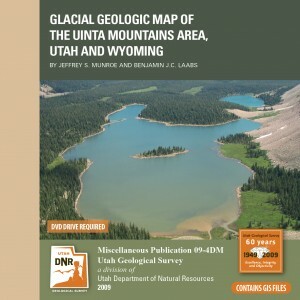 This dataset represents the first complete inventory of the glacial deposits in the Uinta Mountains since Atwood (1909) described the glacial geology of this area. It is the result of previous and continuing work by the authors and others to better understand the glacial and climatic history of this fascinating area. It depicts the distribution of glacial deposits and post-glacial sediments including mass wasting, lacustrine, and rock glacier deposits. A discussion of the glacial history and a figure showing a reconstruction of the ice extent during the local Last Glacial Maximum are also included. 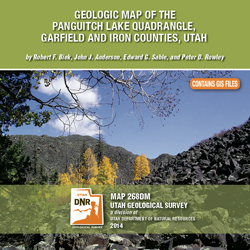 This DVD contains the geologic map at 1:100,000 scale in PDF format and an ArcMap 9.3 map document. Geographic Information System (GIS) files are provided in an ESRI file geodatabase and as ESRI shapefiles. Metadata, PDF, HTML, text, and image files are included to help the user view, evaluate, and use the spatial data. 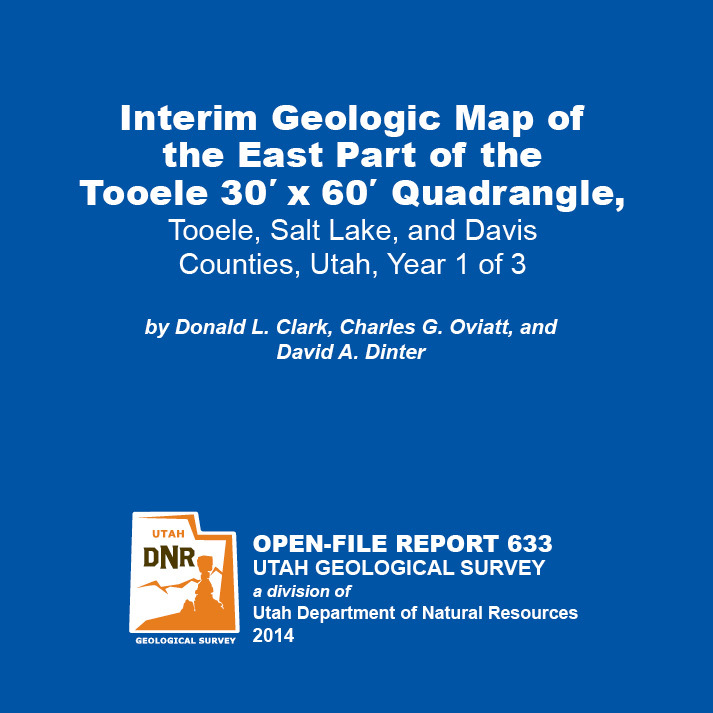 This quadrangle is located in central Utah within the eastern Basin and Range Province. 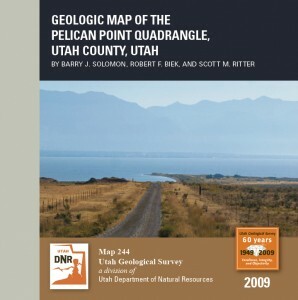 The quadrangle includes the northern part of Utah Lake in western Utah Valley, the northern and northeastern lakeshore, and Pelican Point, extending into Utah Lake from the eastern edge of the Lake Mountains. Bedrock near Pelican Point includes Mississippian-age sedimentary strata on the eastern limb of the Lake Mountains syncline. The majority of the quadrangle is covered by Utah Lake, which is underlain by normal faults that form the western boundary of Utah Valley. Surficial deposits along the lakeshore are primarily associated with lacustrine deposition from Holocene Utah Lake and its precursor, late Pleistocene Lake Bonneville.